They’re back and more entertaining than ever! 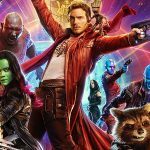 We will be showing Guardians of the Galaxy 2 (2017), a movie about an eclectic band of superheroes. Peter Quill and his fellow Guardians are hired by a powerful alien race, the Sovereign, to protect their precious batteries from invaders. When it is discovered that Rocket has stolen the items they were sent to guard, the Sovereign dispatch their armada to search for vengeance. As the Guardians try to escape, the mystery of Peter’s parentage is revealed. This movie is intended for adults and mature teens. It is free and movie-goers may bring their own snacks and covered non-alcoholic beverages.